Be the first to share your favorite memory, photo or story of Clela. This memorial page is dedicated for family, friends and future generations to celebrate the life of their loved one. Clela Marie (Madison) Sloan, 85, longtime Stillwater resident, passed away September 29, 2018 at her home in Golden Age Nursing Home in Guthrie, Oklahoma, where she and her husband Bill have lived since October 2017. Services have been entrusted to the care of Dighton-Marler Funeral Home of Stillwater. Clela was born on December 23, 1932 in Stillwater to Versal and Frances (Lucas) Madison. She attended Pleasant Valley School near Stillwater, and graduated from Stillwater Public Schools. 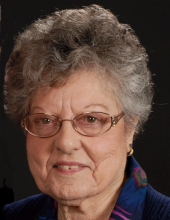 Clela was an active member of Calvary Assembly of God for more than 50 years, and a dedicated helpmate to her husband in whatever he chose to do. They loved to travel and vacationed often. They often socialized with people by playing board games in their home. At times, when needed, Clela worked part time at a dry cleaners, or at Stillwater Public Schools as an assistant in the kitchen. Clela is survived by her husband of 64 years, William F. (Bill) Sloan, of Golden Age Nursing Home in Guthrie; son Michael William Sloan; brother, Van Hubert Madison and wife Mary Ann of Grants Pass, Oregon; and grandson, Dustin Michael Sloan. She is also survived by three nieces, Debbie (Madison) Dull of Eugene, Oregon; Susan Madison of Castle Rock, California; and Alice (Madison) Corigliano of Black Diamond, Washington. She was preceded in death by her parents; one brother, Calvin Madison; and a sister, Doreen (Madison) Meeder. Visitation will be on Thursday, October 4, from 9:00 a.m. until 8:00 p.m. at Dighton-Marler Funeral Home, 5106 N. Washington in Stillwater. A celebration of Clela’s life will be held at 10:00 a.m. on Friday, October 5, 2018, at Calvary Assembly of God, 2315 E. McElroy, Stillwater, Oklahoma, with Pastor Rusty Rhoads officiating. Interment will immediately follow at Sunset Memorial Gardens in Stillwater, Oklahoma. In lieu of flowers, the family requests that contributions be made to the benefit of her grandson, Dustin Sloan in c/o Dighton-Marler Funeral Home, 5106 N. Washington, Stillwater, OK, 74075. To send flowers or a remembrance gift to the family of Clela Marie Sloan, please visit our Tribute Store. "Email Address" would like to share the life celebration of Clela Marie Sloan. Click on the "link" to go to share a favorite memory or leave a condolence message for the family.